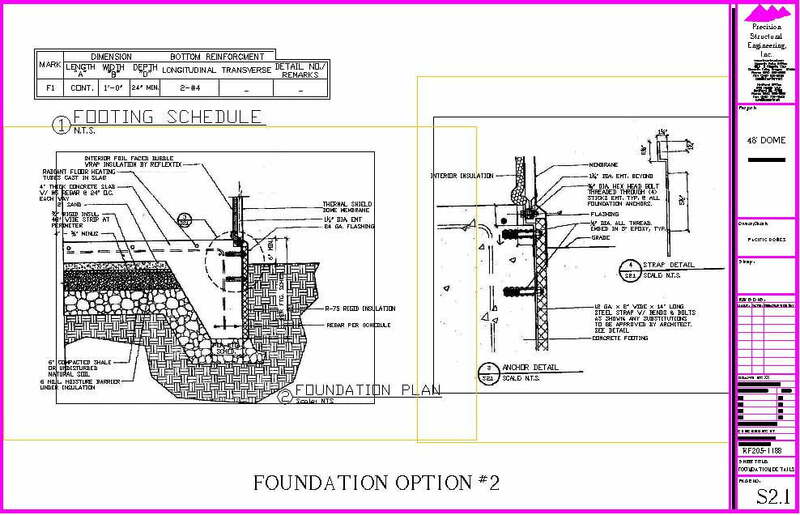 Precision Structural Engineering offers event and dome home design with your specifications in mind. 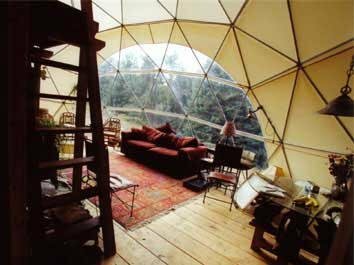 Domes are nature’s perfect structure and provide a unique environment for every use. Geodesic Domes are beautiful, futuristic and synergetic structure. Domes are the strongest portable structures known to man. They are highly portable, quick and easy to erect with a ratchet and are engineered to withstand hurricane force winds and heavy snow loads! 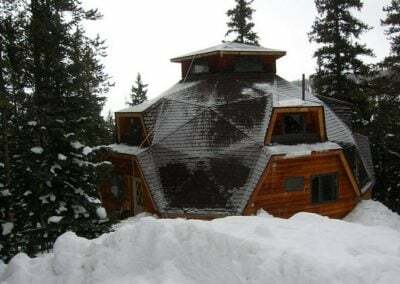 The American Institute of Architects has acclaimed the geodesic dome “the strongest, lightest and most efficient means of enclosing space known to man.” They handle hurricane winds, extreme snow loads, and are the safest structure in an earthquake. 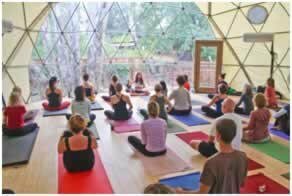 Geodesic domes are very versatile, and are used all over the world for many purposes such as recreations, conferences, meetings, gatherings, marketing events, museum, shelters and homes. Many sizes are available, depending on the application. The larger domes are used for warehouse, distribution of supplies, and also for kitchens and food services. 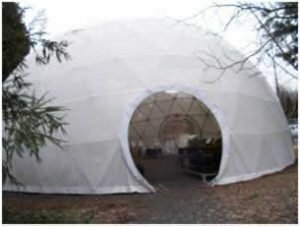 Mid range domes are perfect for classrooms and medical centers. Smaller domes provide a safe and weather proof shelter for displaced families. 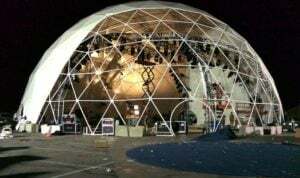 Two, three or multiple domes can be connected with short or long tunnels through Event Round doors. (Most pictures are courtesy of Pacific Domes, Ashland, Oregon, pacificdomes.com. Event Lite fabric is lightweight for ease of setup and perfect for digital projections. Logos and branding can be applied to Event Lite. This extremely translucent fabric allows images to be seen both inside and outside the Dome. Event Vinyl fabric is extremely durable and perfect for long term outdoor events. Logos and branding can be applied to Event Vinyl. The entire cover can also be printed. It is available in Blackout for daytime projection theaters. Event Vinyl is a vinyl coated Polyester, 17 oz. /sq. yard, flame resistant, water/mildew/UV resistant and available in many colors. 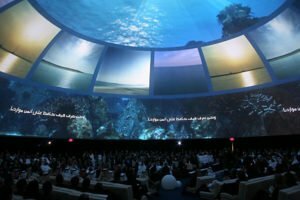 At right is a 90 foot dome for Dubai, United Arab Emirates. Opalescent Stretch Lite fabric is beautiful for indoor events. It is perfect for digital projection as the translucent quality of the lighter colors allows images to be seen both inside and outside the dome. You can purchase wooden dome kits and even do it yourself, or we can design a wooden home according to your instructions. Just because a dome home looks different, doesn’t mean the inside isn’t comfortable or inviting. You can design the interior complete with bedrooms, bathrooms, kitchen, living space and more. You can also customize your dome home any way you wish. Call to speak with one of our engineers today. 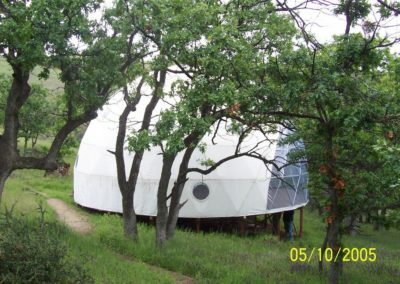 Your dome home can be your permanent residence, or it can be used as a vacation home. If you use for it for a vacation home, please consider a minimalist design. A vacation dome home would be ideal in a wooded setting, or in the middle of a clearing. Dome homes come in a variety of sizes. We’ll work to design one that fits your spatial needs. Versatility – from a tiny cabin to a multi-level home or commercial building, round fits any construction requirement or individual lifestyle. Reduced consumption and energy efficiency with no corners to trap cold air. Superior strength – round homes have proven to stand up well against extreme weather conditions, including hurricanes and heavy snowfall. High market value and desirability – aesthetics, durability and quality. 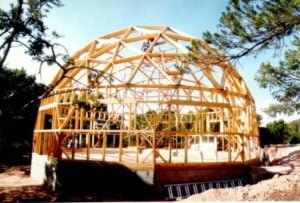 The EconOdome building frame is comprised of triangles formed with precision cut lumber, and held secure with metal screws, straps, and wires. The EconOdome building is also clad on the exterior with composite cement sheeting. Due to this unique combination of materials and construction methods, the EconOdome building may be reliably sealed using a sealing technique called the “saturated seal”. 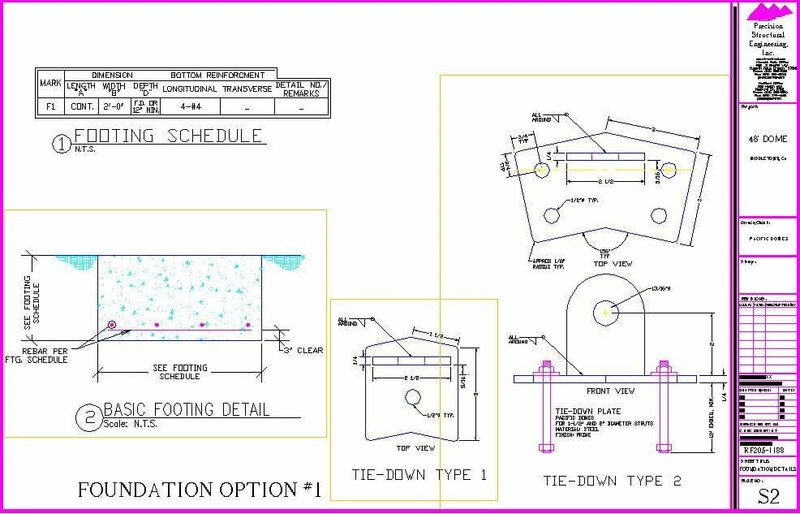 This proven method of sealing involves brushing an elastomeric sealer under and over stretchy polyester cloth seam tape that is applied over all seams and nail/screw penetrations. Please visit econodome.com. If interested, give us a call. We design green homes in Arizona, California, Colorado, Connecticut, Florida, Hawaii, Idaho, Illinois, Iowa, Kansas, Louisiana, Missouri, Montana, New Jersey, New Mexico, Nevada, New York, Oregon, Pennsylvania, Utah, Virginia, Washington, and Wyoming. Geodesic dome, round and circular homes are the strongest, lightest and most efficient means of enclosing space known to man. They handle hurricane winds, extreme snow loads, and are the safest structure in an earthquake. 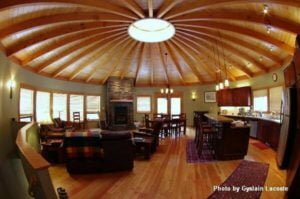 In domes, round, or circular homes, loads are distributed in a three dimensional direction, whereas traditional structures utilize only one or two load directions. Think of how an egg with a very thin skin can resist a relatively high uniform load. The same is true of domes. They can resist a relatively large load with a very small amount of materials. 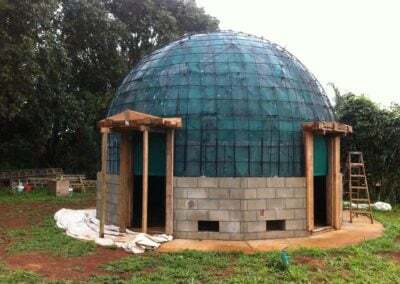 This is why dome and circular homes are very efficient and economical structures. Wind load applied to the surface of the dome. For most domes with light weight, wind load usually control over seismic loads. Applying wind load perpendicular to the surface of each element of the dome could be time consuming. We use Meca Wind to calculate the wind load according to the International Building Code, IBC, and then apply the wind load as the element load using RISA software. 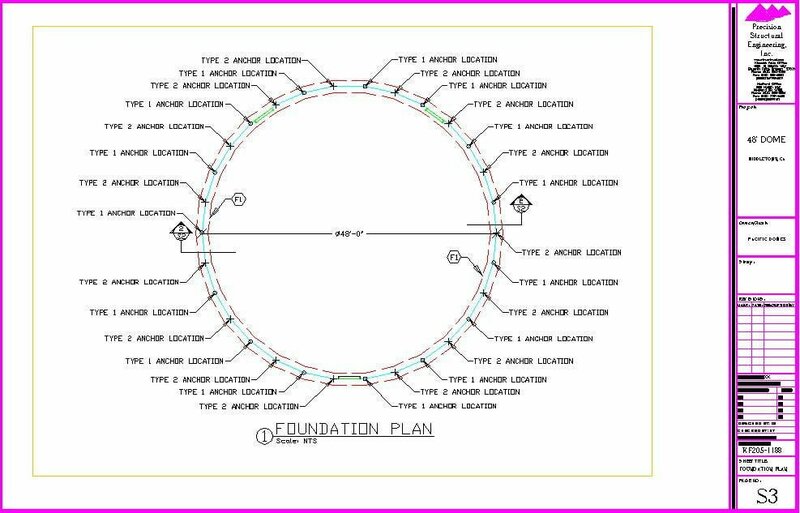 Resisting the Uplift Forces for Domes, Round and Circular Homes. For permanent domes, the connection shown below is used successfully. Barrel filled with water at every other joint at the bottom of the dome. Concrete blocks at every other, or every third joint at the bottom of the dome. Pins and stakes driven into the ground.